What is more important than someone's life? In the health area, management is critical to the financial stability of the institutions and the documentary process improvements of the patient and the organization. 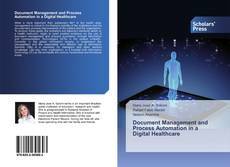 To achieve these goals, the indicators are important elements which, in a health institution, begin to point positive evidence on the use of document management and process automation through Information and Communication Technologies (ICTs) in the system e-Health. Currently, in the global information society, to understand the management and the responsible and efficient use of Information Systems (SIs) is a necessity for managers and other workers knowledge. Like any other organization, in a hospital both Information Technology (IT) as SIs permeate the various hierarchical and functional levels.